Located on the second floor of the historic Old Gaol prison, and serviced by a lift from the underground car park, this luxurious serviced apartment has two bedrooms, bathroom, open plan kitchen/living area and has been sympathetically restored to retain many of the original beams that add further character to this tastefully furnished apartment. 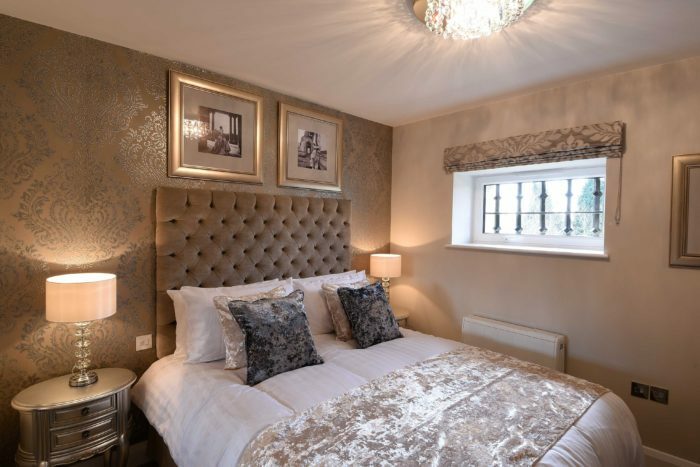 Guests can experience spectacular views of the River Thames, Abingdon Bridge (formerly known as Burford Bridge), Nags Head Island and “chocolate box” views of historical landmarks within Abingdon-on-Thames. unlimited use of the residential gym. Contemporary handle-less kitchens that combine practicality with luxury and feature opulent touches such as quartz stone worktops and Bosch appliances. All of our apartments include integrated double oven, induction hob, stainless steel extractor hood, microwave, dishwasher, fridge freezer and washer/dryer, plus a fashionable stainless steel bowl sink with chrome mixer tap. Our bathrooms and ensuites are fitted with a contemporary white suite, which includes concealed cistern w.c. shower with chrome fittings, heated chrome towel rail, vanity units and mirrors. Bathrooms floors and walls are fully tiled. All internal doors are finished in an oak veneer and fitted with attractive contemporary chrome door handles. We provide plenty of sockets in our serviced apartments and telephone sockets in the lounge and principal bedroom along with a flat screen TV with Sky HD and a DAB radio in the lounge, unlimited broadband, internet and a USB port. All bedrooms also have TV points. Our serviced apartments are highly insulated and fitted with thermally and acoustically efficient, double-glazed windows. Central heating is provided via a cost-effective electric system, with hot water being supplied via an Ecocent heat pump. Every bedroom has built-in mirrored wardrobes and most apartments include integral storage in the hallway. Entry to the Old Gaol building is controlled via secure door entry and individual apartments are fitted with a video door entry handset. A mains smoke detector system with battery back-up pack is also fitted to each apartment as well as fire sprinklers for additional peace of mind. Safe Deposit Boxes are also fitted in each apartment. Most of the serviced apartments overlook the River Thames and benefit from both contemporary landscaping and listed gardens. Every serviced apartment has an allocated parking space in the underground car park. The main car park entrance is fob operated and access to the lift is via a secure gate. Look at The Roysse Suite as this will provide you with an opportunity to enjoy outside living with stunning views of the River Thames and the historic St Helen’s Church. Please note: As this is a Grade II listed building, this apartment is not suitable for people with reduced mobility. However, where possible, we are more than happy to assist guests who wish to stay in the town centre in finding alternative accommodation. The Tomkins were among the leading families of Abingdon-on-Thames whose wealth came from the malt trade and banking in the mid-18th century. The family built impressive houses in Abingdon, notably Twickenham House (built in 1756 for Joseph Tomkins) in East St Helen St. It is renowned for its brickwork and the building has retained many original internal features, notably the main staircase, doors, doorcases and fire surrounds. Other houses included The Clock House, Ock St, and Stratton House, Bath St (built around the 1720’s for Benjamin Tomkins). The newly refurbished restaurant quarter is located in Bridge Street, adjacent to the Old Gaol. Currently being developed, these will offer residents of the Old Gaol Serviced Apartments quick and easy access to a variety of food offers. Find out more about restaurant development and opportunities.